The Indian lingerie industry has many brands today, from brands that offer high fashion products at a price that consumers are not willing to pay to brands that offer low quality products at low prices. It’s difficult to find a brand that caters to the needs of a discerning consumer with variety in fashion and functionality. Today’s consumer has a wide wardrobe that matches her need to look fashionable at every occasion, but she also seeks a lingerie brand that empowers her fashion choices. Amanté, being a decade old strong player in the Indian lingerie industry, understood the prevailing gap and is supporting the needs of the woman who dares to be. 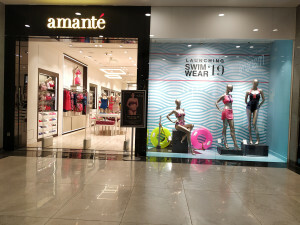 Amanté is a part of MAS Brands, which is a subsidiary of MAS Holdings, South Asia’s largest supplier of niche market intimate wear. It embodies 30 years of excellence held by the conglomerate in lingerie manufacturing. MAS Brands, India has been a purveyor of fine intimates for the discerning fashionista, offering in-trend, superior quality products for over a decade. The journey in the pursuit of excellence coupled with the learning and experience over time has made us understand the needs of the market and consumers like no one else. Being synonymous with quality, Amanté takes pride in delivering products designed to fit the Indian body perfectly, made at state of the art manufacturing units. It uses the best quality materials like signature 2mm padding for moulded bras, patented fortitude underwires for wired bras, advanced construction and fit, with designs in-line with global trends. With the desire to offer the best to the consumers, Amanté has recently launched the new Sculpt Wire collection, which offers bras with an encased wire. With fashion and functionality at the core of Amanté, this evolved new range provides the support of a wired bra with the comfort of a non-wired bra. The encased wire is a technology where a soft silicon wire is encased within the cup of the bra to provide better comfort to the wearer. Designed keeping in mind the busy lifestyle of modern day women, the flexible underwire allows ease of movement. Realising that different types of consumers were underserved in the market, MAS brands has expanded the offering with two more brands under its umbrella, everydé by Amanté and Ultimo. Identifying a gap in the Indian lingerie market for the full figured consumers, MAS brands launched Ultimo, the full figure specialist brand. With a wide range of lingerie exclusively for this consumer, it offers a range from band size 34-42 and cup sizes C – DD, with product offerings like minimizers and strapless bras. every dé, the sub-brand of Amanté was introduced to the market to serve value-conscious customers, bringing the same promise and quality of Amanté at pocket-friendly prices. fashionable, trendy everyday lingerie to give women a daily dose of style and comfort. The collection caters to suit every need of a woman, through styles offering support, modesty, contour, shaping, and loungewear, making every dé, the ultimate daily wear lingerie brand. The collection provides basics of fashion with a complete range of functional lingerie while still staying stylish, at an affordable price range starting at INR 495.